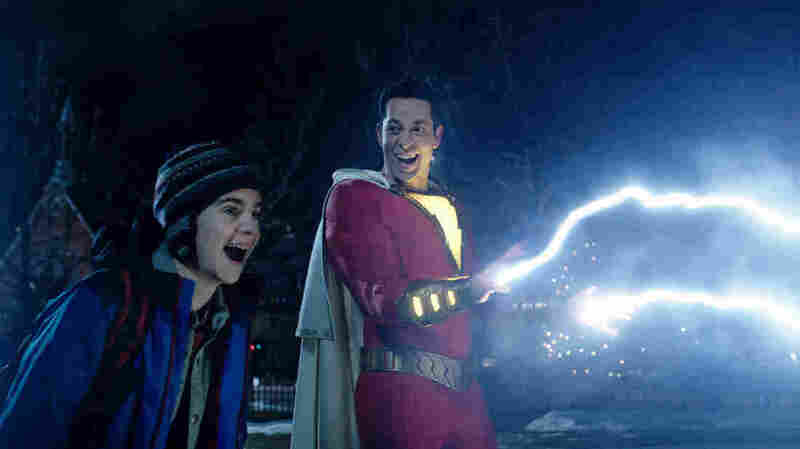 Review: 'Shazam' - Thunder And Lightness, Just A Bit Of Triteness The breezy, funny elements of DC's latest superhero film feel so fresh they throw the movie's duller, more rote sections into sharper relief. Let there be light...ness: Freddy Freeman (Jack Dylan Grazer) and ... well, he goes by many names, long story (Zachary Levi) forget their troubles, come on and get zappy in Shazam! The cultural narrative that's built around films starring DC Comics superheroes over the course of the past decade or so reads thusly: DC films are too dark and dour, and the company should take a cue from Marvel, whose films always leave room for the fun and whimsical elements so crucial to the superhero genre. It's a gross oversimplification, but there's no denying the kryptonite-hard nugget of truth there: Years ago, Warners/DC executives looked at the runaway success of Christopher Nolan's dark and dour The Dark Knight trilogy, and concluded that they'd cracked how to approach the superhero genre, once and for all. But they'd conflated the "once" with the "for all." Because of course what they had instead cracked was how to approach one particular superhero — a dark and dour one. It was a failure of insight akin to mistaking a huge forest, teeming with verdant and varied biodiversity for one lone, particularly spooky and gothic-looking willow tree. Different heroes don't just come factory-installed with differing sets of powers and color-blocking, but with different outlooks, motivations, goals and fears. For movies about them to work, these characters must be approached in the particular narrative mode and tonal valence that best resonates with them. Spider-Man isn't Thor, Thor isn't Iron Man. Knowing this, truly knowing this, makes for effective characterization, and effective characterization means these characters can be brought into conflict with each other — delineating the contours of their hard edges by bashing them into each other, again and again, as in films like Captain America: The Winter Soldier, Captain America: Civil War and, especially, Thor: Ragnarok, a film that worked best when it gleefully and repeatedly undercut the gravid, Asgardian pomposity for which its audience has grown to know, and love, its hero. But for DC/Warners, superhero capes came one-size-fits-all: They followed up the Dark Knight films with the similarly grim, dun-colored Man of Steel and Batman v Superman: Dawn Of Justice, a movie that attempted to draw its two main characters into a conflict that made no sense, because so little daylight could be found between their respective characterizations. Wonder Woman represented a welcome and purposeful step forward, Justice League an Olympic-level long jump backward, and Suicide Squad ... was also a movie that was somehow made and released. It would be easy to say that the latest DC superhero outing, Shazam!, represents DC/Warners finally learning how to pivot, how to come at a given hero in the mode that suits them best. It's certainly true that the film's stuffed to its gills with goofy gags and clever winks, and that the film's resident good guy (his name's "Shazam!" in the credits, but in the movie's reality, it's more an open-question kind of deal) is a puffed-up, square-jawed galoot in a tomato-red getup played by Zachary Levi. But it also frequently stops dead in its tracks to dutifully attend to more familiar, straight-ahead genre business. The fun bits — the way it transforms the usually brief "superhero training montage" sequence into an extended and rewarding running gag, for instance — are so fun, and fresh, and invigorating, they can't help but throw the story's duller, genre-dictated passages into sharper relief. Shazam! kicks off with an extended flashback that turns out to be our villain's (Mark Strong) origin story that, yes, does outfit him with a key characterizing detail that will pay off nicely in the third act (the film gets better and more joyful as it goes, unusually enough). But there's so much of that backstory that you will feel every last minute of the film's two-hour-and-twelve-minute running time. As young Billy Batson, who becomes imbued with the ability to transform himself into a crimson-longjohnned super-champion, Asher Angel is understated and naturalistic. As Billy's voluble best friend Freddy Freeman, Jack Dylan Grazer turns in a standout, eccentric, nicely calibrated performance — one that tiptoes to the edge of annoying, and constantly threatens to tumble over into the twee school of acting known as Live-Action-Disney-Channel-Weird-Kid, without ever doing so. Levi is a charming actor, and he hurls himself into the title role, and into the muscle suit that comes with it. He's playing the grown-up-super-swole-Billy with broad, goggle-eyed gusto that doesn't really jibe with Angel's performance in any way you can point to — but it doesn't particularly matter, because he's such a goony, game presence. But what this film does do is build, steadily, to a joyous, colorful conclusion — a superhero vs. supervillain battle-royale that's compelling, easy to follow, frequently funny and, crucially, satisfying. It's an ending that wears its heart on its sleeve, and that makes the story's subtext — wish fulfillment, which is the subtext of all superhero stories — so emphatically and explicitly text. A lonely kid finds a magic word that transforms him into a champion, and also, not for nothing, finds him a family. The pure and simple imaginative power of that. It's the superhero refined to its thematic essence: so clean, so clear and — happily! importantly! unabashedly!— so, so goofy.